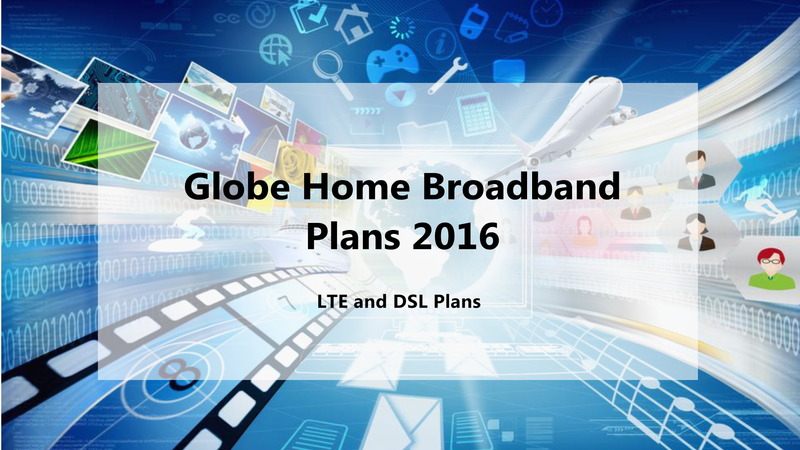 This article tackles about the new 2016 Globe Home Broadband Plans for DSL and LTE. To view the old discussion thread, please visit the old article here: Globe LTE Home Broadband Plan Review. The said post also include some info about the “Anti-Bill Shock” alternative for those who wanted to go “mobile” and willing to pay a bit more. The Anti-Bill shock feature is very handy, especially for those who does not want the current cap imposed on the current broadband plans. June 2017 News: Globe recently launched new broadband plans with Globe At Home Go Big and Go Fast branding. See the new 2017 plans here. November 1. Updated article to reflect recent reports of users about monthly allocation limit and throttling. Read more about this on Monthly Bandwidth Allocation section. September 14. Article has been updated to reflect the additional Plan 1199 and some changes with other respective plans. As seen above, there is not much changes from the 2015 offering for the Plan 999 and 1099. For example, Plan 1099 retained the same speed at 2mbps. However, changes kick in when we look at Plan 1199 and up. As expected for Plan 1299 with 10mbps speed, monthly data/volume allocation for DSL is higher than LTE (100GB vs 50GB). The same volume allocation is also provided for Plan 1199, but with a slower speed of 5mbps. Moving on, Plan 1299 is already the highest plan offered for LTE. When we go at a higher speed (15 mbps and up) it is either via DSL or Fiber. As a comparison, 15mbps speed is also offered under LTE connection before. 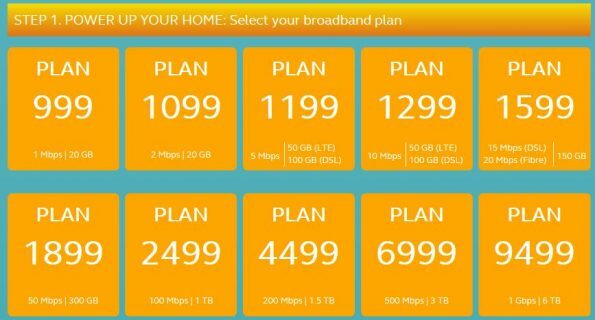 Since the new plan offerings are too many to mention, you can check out yourself the new offerings and may apply/upgrade for the new plans at http://shop.globe.com.ph/shop-by-plan/broadband. 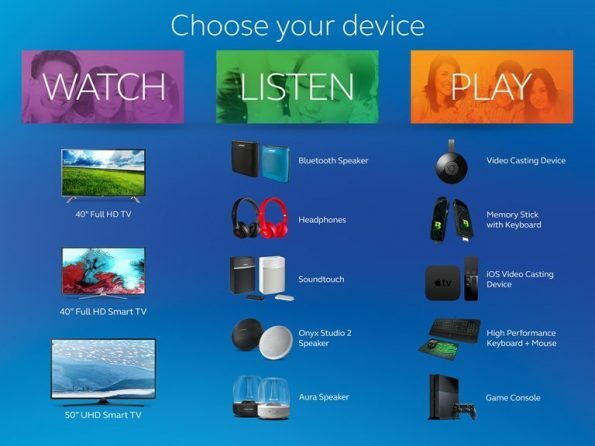 You can also check out the main page of Globe Home Broadband at http://www.globe.com.ph/broadband. It seems like the “Tattoo” monicker will now be offered and used only for mobile data services. Bundles with TV, Game console, speakers come with a Cash-Out. (available for selected areas only). Users who have 50GB monthly allocation, will be throttled down to 30% of their subscribed speed when 50GB is reached (e.g., 10mbps x 0.3 = 3mbps) , but once additional 50GB is again consumed, the speed will go down to 256kbps. => I confirmed this before, Globe says it will stay to 30% and will not go any lower. Users who have 50GB monthly allocation, will experience a slow speed of 256kbps once limit is reached. => Obviously, not 30%. Users who have 50GB monthly allocation, will experience 30% throttled speed when 100GB is consumed. => Allocation has been doubled, before being throttled down to 30%. Users who have 50GB monthly allocation, will experience a slow speed of 256kbps when 100GB is consumed => Allocation has been doubled, before being throttled down to 256kbps. Some customer service representatives still insist that speed will just be throttled down to 30% when allocation is consumed. Others say, it is 64kbps. => 64kbps is against the NTC rule since broadband connections should have atleast 256 kbps. The 256kbps throlling only applies to LTE plans. DSL subscribers can enjoy the 30% unlimited internet. <= This is unfair, especially for those who signed up for LTE and was promised for the similar 30% throttled speed. 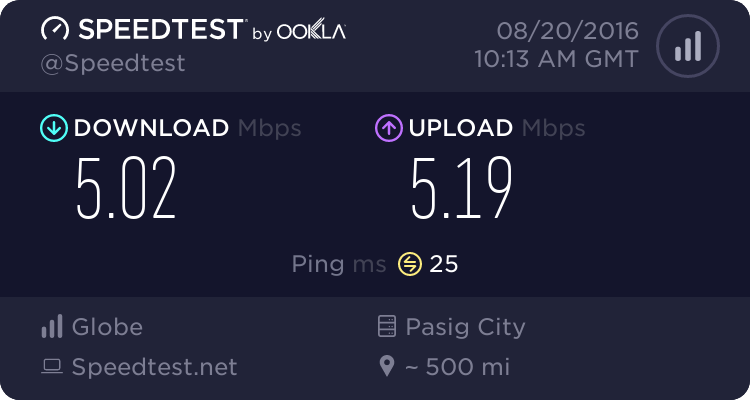 If you are also experiencing this kind of speed even you are under DSL, kindly request a technician to visit you, or request Globe to have your connection be check, since the plans say that speed will only be throttled once, only 30% fixed across all plans. For LTE users, let us hope that this is only a system glitch or temporary. Since the terrible slow speed just seemed to occur only a month ago. Also, it seems like the problem is a case-to-case basis because not everyone under LTE plan is experiencing the same throttling, as enumerated on the scenarios above. For LTE users, it is already confirmed that throttling to 256kbps will occur after consuming your data allowance. For other users that is not experiencing this, I guess you’re lucky. All new DSL plans still follow the 30% subscribed speed rule when monthly volume/bandwidth allocation has been reached. Meaning to say, for Plan 1299 10mbps, speed will go down to 3mbps when 100GB is reached (for DSL). It will reset every first day of the month, regardless of your plan’s cut-off date. If you wish that your speed will not be throttled, you may purchase volume add-ons starting at 50GB (DSL) for P99/month. For LTE plans, throttling to 256kbps will occur after consuming the data allowance. If you have no other choice than LTE plan, Data Boost Add-ons are your day saver, at a cost. You can inquire directly with Globe with the latest pricing for Volume/Data Boost Add-Ons. Purchased volume boost add-ons are valid for 30 days. Remaining volume boost allocation will be added on top or it will “roll-over” on the next month. Meaning, if you purchased a 60GB add-on in the 17th day of April and unable to consume it all at the end of that month, remaining data will be added on top of the available data allocation for May. Data from volume boost will be consumed first and will be forfeited if left unconsumed. If you want to dig into details about plan activation, wireless landline bundle and billing statements, you may visit the old Globe LTE Home Broadband Plans Review article here. Just jump to the internet service provider section. As for our side, we are able to get the Plan 999 (5mbps, 50GB monthly allocation) under Rubicon last June 2016. This is a downgrade from our old Plan 1099 (2mbps, 5GB daily) from 2015. If you’re wondering about Rubicon , you may read the old Globe Home Broadband Plans Review article on Rubicon Plans section here.